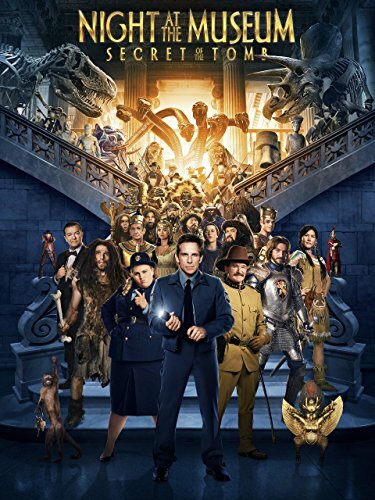 Buy Night at the Museum: Secret of the Tomb or the other films in the trilogy cheaply from Amazon You too can earn money from writing articles by signing up for InfoBarrel. Night at the Museum: Secret of the Tomb is the third, and apparently final film in the series. It starts in Egypt in 1938 with the Ahkmenrah Expedition. A storm is descending on the expedition when a boy, C.J. Fredericks (Percy Hynes-White) falls through into the Tomb of Ahkmenrah, where there are the sarcophagi of Ahkmenrah and his parents, as well as the Tablet of Ahkmenrah. With the storm coming, the site is, well, plundered is the only real description - it's certainly not treated like an archaeological expedition - despite a warning that taking the Tablet will cause the end to come. Ahkmenrah tells Larry that he doesn't know what is wrong with the tablet, as only his father knew how it worked, only that the magic seems to be running out. Larry's investigations reveal that Ahkmenrah's parents' sarcophagi went to the British Museum in London, and so he manages to convince Dr. McPhee (Ricky Gervais) to send Larry, along with the tablet and Ahkmenrah, to London. Once in the British Museum, after getting past the (hopefully deliberately) annoying security guard Tilly (Rebel Wilson, Grimsby), Larry discovers that more than just Ahkmenrah were shipped in the crate; Dexter the monkey, Sacajawea (Mizuo Peck), Attila the Hun (Patrick Gallagher), Teddy Roosevelt (Robin Williams, Absolutely Anything), Jedediah (Owen Wilson, No Escape, The Internship), Octavius (Steve Coogan, Alan Partridge: Alpha Papa, Despicable Me 2) and Laaa, a new Neanderthal exhibit who looks very like Larry, have all come too. Larry's son, Nick (Skyler Gisondo), who he is currently having parental problems with had accompanied him on the journey as well. In the museum they search for the sarcophagi of Ahkmenrah's parents, stumbling across Sir Lancelot (Dan Stevens, A Walk Among the Tombstones, The Guest) along the way, who gives them a helping hand with a dinosaur problem. There are some funny bits, such as when Larry tells Ahkmenrah's father, Merenkahre (Ben Kingsley, Hugo, Iron Man 3), that he is half Jewish and Merenkahre exclaims that he loves Jews, he used to own 40,000 of them. Much of the humour is more of the physical variety, although the interactions between Jedediah and Octavius are usually funny, as well as an appearance by Hugh Jackman as himself, and there isn't really much in the way of plot beyond "fix the tablet and save everyone." There are a lot of special effects, and animated creatures, which do make up for the lack of a genuine plot. The interactions between Larry and his son seem more forced than genuine, and just don't show much chemistry between the pair. Maybe that's more genuine. As the film draws to a close there is the feeling of saying goodbye to the characters from it from within the film itself. The special effects and creatures are great, and Night at the Museum: Secret of the Tomb isn't a bad film, but it's not the best one in the trilogy. It's only been over the last few months I've seen the three movies, I thought this one was OK, but it lacked something the others had, although I can't put my finger on it. Good review! Thanks! I kind of hope they don't do another in the series, as I think that would be pushing it, but you never know. They did kind of seem to leave it a bit open for another one with the new security guard didn't they? (I agree, hope this closes it too).